We’re taking our breakfast game to the next level. 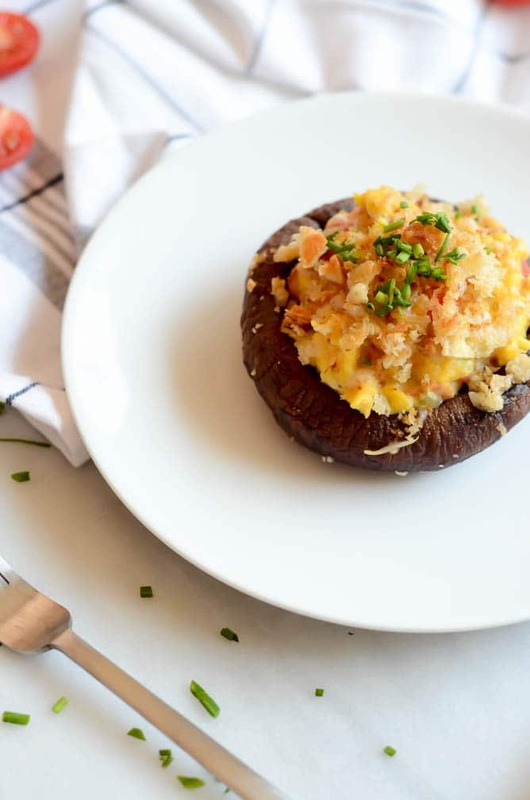 We all know how much I love a good stuffed Portobello mushroom, so naturally I had to make a breakfast version so I have an excuse to eat these tasty, filling ‘shrooms every minute of every day. 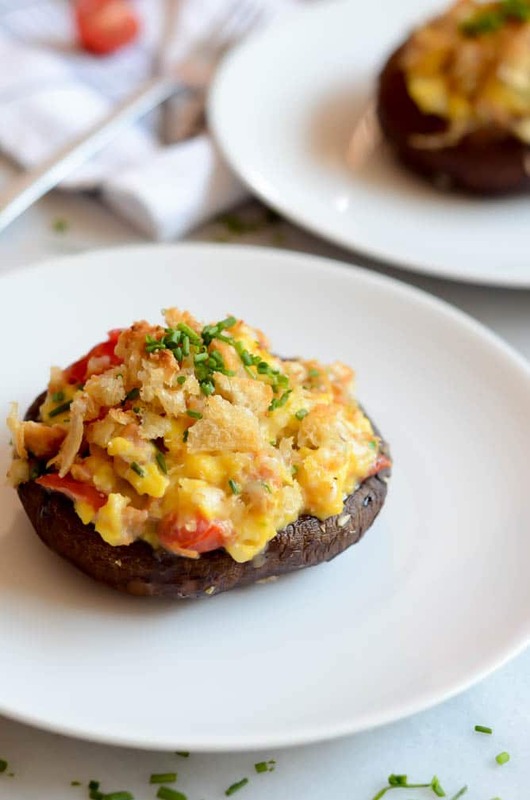 These Scrambled Egg & Sausage Stuffed Portobello Mushrooms will leave you satisfied and wanting more. Maybe you’ll even want to make them for dinner? We love a good BFD in our household. But first let’s chat for a second. I know I mentioned it briefly a week or so ago, but we are now officially ONE MONTH away from Chris and my Big Day!! That being said, it’s time for us to buckle down and really focus on putting whole, nutritious foods into our bodies for the next four weeks (with some exceptions of course, we still have the Fourth of July and one more wedding to get through before then!) I’ve decided to take you all along for the ride, so get ready for some super delicious and nutritious recipes coming your way in the very near future. 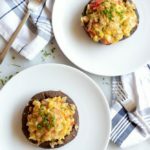 What I DO think is awesome about these stuffed ‘shrooms as a breakfast item is the fact that they get you soooo much protein first thing in the morning and they will keep you full for hours on end. None of this fruity, carb-laden stuff that wears off an hour or two after you eat it. Chris and I actually had these for dinner and, since we hadn’t had lunch that day, I plated up two for each of us, but we both could only get through the first ones because they were so filling. Hooray for leftovers! They made a GREAT lunch today. You get all of this blood sugar-stabilizing protein from both the Portobellos and the eggs, with a little extra added in from the sweet chicken Italian sausage and cheese. 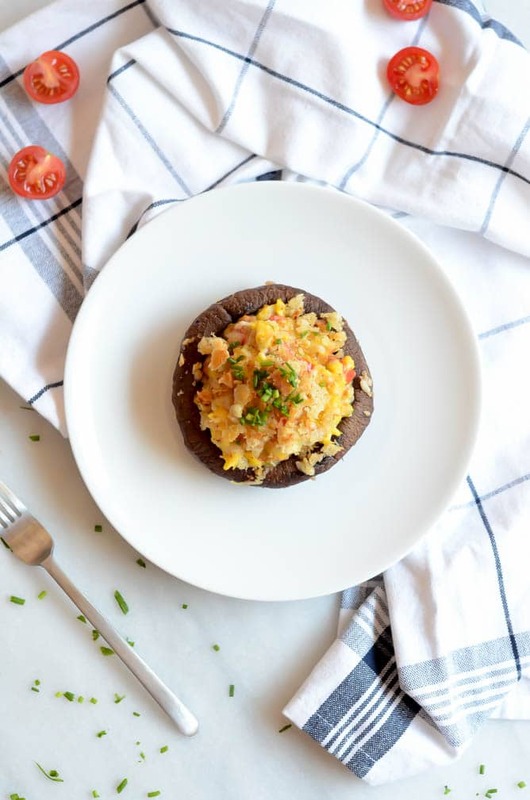 I think we’re safe to say that the Portobellos also count as a vegetable, so with the addition of fresh chives and tomatoes we can practically say we’re eating a salad for breakfast. These reheat surprisingly well, which means you can easily prep them the night before and just pop them in the microwave or oven in the morning and have breakfast fit for a king in less than five minutes. Just be sure you don’t overcook your eggs in the first place if you’re planning to go this route. I left mine with just the slightest bit of runniness before loading them into the Portobellos as stuffing, so when I reheated them in the microwave they came out perfectly. We clean and de-stem some huge, meaty Portobello mushrooms and brush them with an olive oil and fresh garlic combo. Before placing them in the oven we sprinkle on some salt and pepper because seasoning is king. We roast our Portobellos for just a bit, then take them out of the oven and let them cool. We cook up our Italian sausage and set it aside, then start with the scrambled egg mixture. In go eggs, fresh chives, tomatoes, cheese, and don’t forget the sausage! We scramble those around until there’s just the tiniest bit of runniness left, and scoop the mixture evenly amongst our mushroom tops. Finally, we whip up our trusty sourdough breadcrumbs, laced with just a bit more cheese. 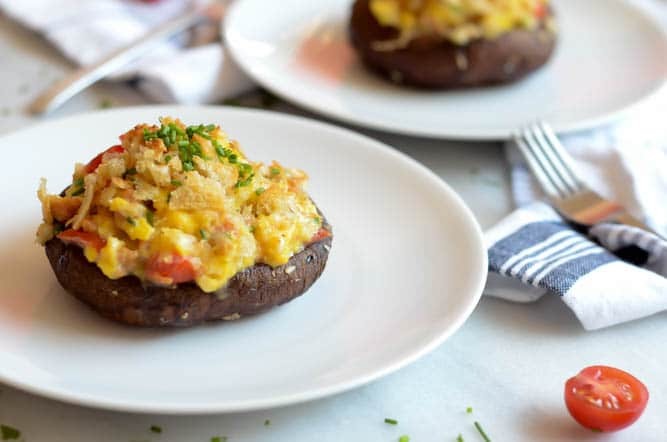 The sourdough breadcrumb-cheesy topping is the key to really taking these stuffed mushrooms into breakfast land. 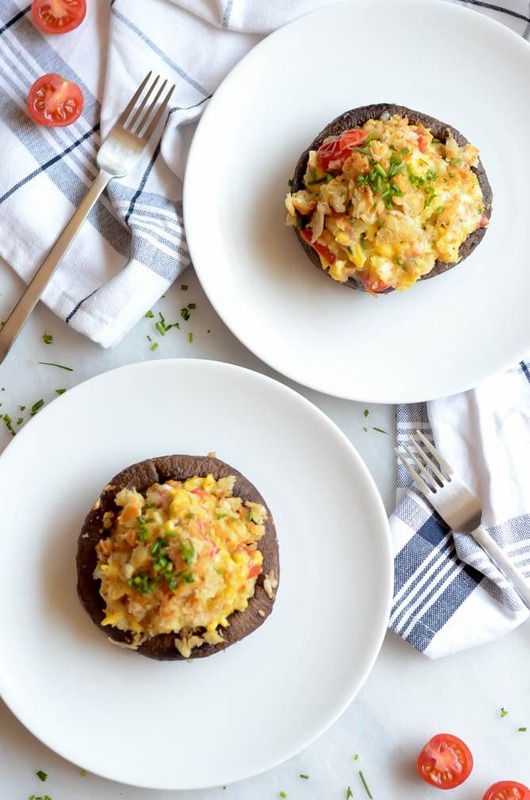 A delicious, protein-packed breakfast version of the classic stuffed Portobello mushroom. A great way to start your day off on the right foot! Preheat oven to 350 degrees Fahrenheit. Line a jelly roll pan with aluminum foil or parchment paper and place Portobello mushrooms on it. Combine garlic and olive oil in a small bowl and brush over mushrooms. Be sure to brush both the top and the bottom to get an even coating. Sprinkle with salt and pepper and place in preheated oven. Bake for 15 minutes. Remove from oven and set aside. The mushrooms may come out a bit soggy due to the natural moisture in them, but some of that will soak back in as the mushrooms cool. Once you are ready to load them up with the filling, you can gently dump out any moisture that has not reabsorbed. In a medium sauté pan over medium-high heat, cook the Italian sausage. Once sausage is done, remove to a paper towel-lined plate to drain and cool. Place eggs in a medium mixing bowl and whisk to scramble. Using the same sauté pan as you did for the sausage, begin cooking eggs over medium heat. Low and slow is the way to go when cooking these to be sure you don’t overdo it. Almost as soon as you’ve added the eggs to the pan, add in the cherry tomatoes, chives and ¼ cup of the shredded cheese. Stir until eggs are mostly scrambled, with just a little bit of wetness remaining and then stir in the prepared sausage. Using a food processor, break down the sourdough bread into small crumbs. Heat butter in a medium sauté pan over medium-high. Once butter is melted, add sourdough breadcrumbs to pan. Let cook, stirring every so often to prevent burning, until breadcrumbs take on a golden, toasty color. Remove breadcrumbs to a small bowl and stir in remaining ¼ cup of shredded cheese. Sprinkle mixture over the top of each mushroom. 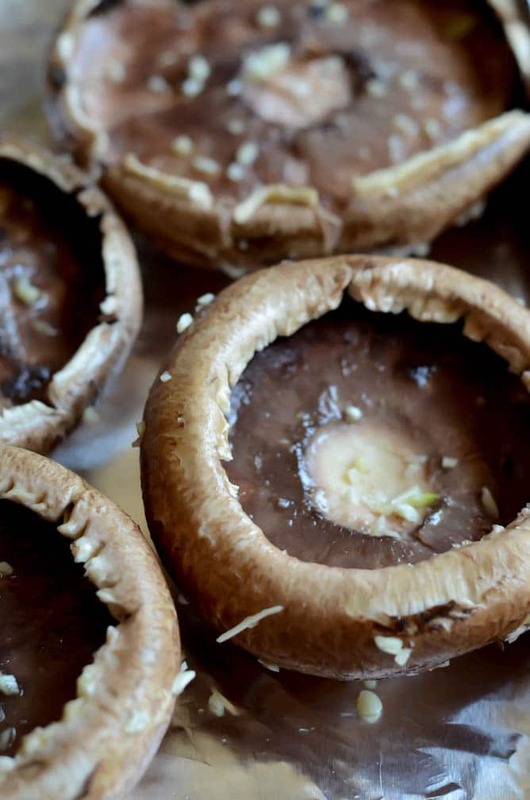 Turn your oven broiler on high and place stuffed mushrooms under it for about 2 minutes. This will help further toast the breadcrumbs and melt the cheese. Remove from oven and let cool slightly before serving.